A girl with a dream. A girl in love with words and pictures. In 2013, my first short story Stage Fright, published in a young adult anthology with the theme of time and what happens when it stops. Next up, May 2017 brings Hero Lost: Mysteries of Death and Life with a short story, a fairy tale, about the Kansas Wheat, since I’m a Kansas girl. I’ve always wanted to write. I just couldn’t figure out how to get to that point until I was nearly thirty years old. I’ve dabbled a little in everything, from Dietetics, Zoology, Landscape Architecture, Advertising, and finally settling in to Fine Arts, Graphic Arts. I’ve been in the professional world of Communications and Public Relations for more than 10 years, serving in just about every capacity you could imagine. I started this blog a few years ago as an accountability goal to myself. I wanted to keep my inspiration alive and to maybe share a few tips and frustrations from my own process. I hoped along my personal journey, I could maybe inspire a few others along the way. Maybe if you were once like me and you were not quite sure how to begin to take that first step and reach your dreams, you might see what I’ve done and figure out a place to start for you. So I’m happy to share my life if it means I can help, or inspire, or create some sort of thought. Life is messy–just a bunch of mismatched puzzle pieces, and I’m okay with that thought because when I began to let go of the perfection, the fears, and decided to take a step everyday in the real shoes I wear, I realized I love life, no matter what happened in my day. I have two beautiful kids. 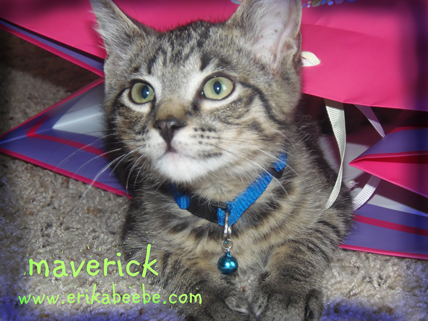 Maverick, A fun loving kitty. 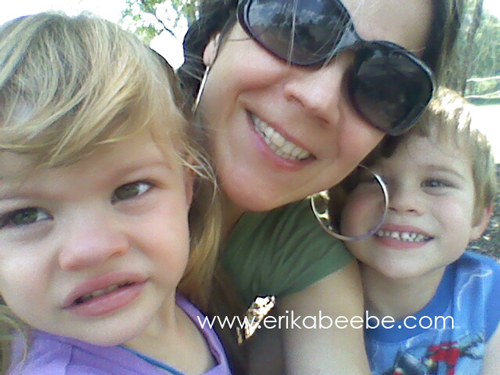 I’m writing as much as I can when my kids are carefully tucked away. So stay tuned to my blog and let me know how I’m doing. Erika, thanks for following my blog, which brought me here to yours. I’m looking forward to reading more! Hi Erika! I’m getting ready to send out the files for my cover reveal next Monday, and I realized I don’t have contact info for you. Could you send me your e-mail address? My address is lmaclaug82@gmail.com. Thank you!! I was wondering what your policy is on accepting review requests? I have a YA paranormal book I’d love to chat with you about, if you’re interested. My email is clmannarino@hotmail.com Thanks! Thank you for choosing to follow my blog. I appreciate it very much. We talked a while ago about you joining my blog hop for Twenty-four Days. If you’re still interested, I’d love the help! I seem to have lost your email. Would you email me at askatechteacher@gmail.com and I’ll send you all the info.